So I got really excited tonight when I thought I had an epiphany about hubby's new iPad and my blog. As I was browsing pinterest and reminding myself that I should be blogging about some of my completed projects instead of pinning new ones, I realized that the iPad has a camera, a new fun editing program (courtesy of hubby) and the internet. Now this may not seem that special, but I ecstatically asked, "So, I could take a picture with this, edit it using SketchBookPro, and then upload it to my blog ALL using the iPad?!!" This would mean, no camera, camera battery, camera cord, or laptop?! Then I proceed to open up weebly to post about my picture I just took, and here is the lovely error message I received, "This device requires Adobe Flash." OK, fine, I know my way around a quick download....accept, next, next, next, next, next, finish.... right? So I ask hubby if I can download Flash for the iPad and he informs me that, "Duh, Apple products aren't able to support Flash, everybody knows that! Haven't you heard people complaining about it for a while?" No, I haven't heard, those aren't really the types of blogs I subscribe to ;-) But, babe, I am so glad you read those....you have saved us so much mullah! So now I have the edited picture on the iPad but no way to post it to my blog!! Grrr!! Rather than quit...I am a teacher with more patience than you could imagine..... I decide to download Dropbox on my laptop so that I can simply drop the picture into Dropbox on the iPad and then retrieve it on my laptop and upload it to weebly. This has been a program on my to-do list for a while now due to my printing debacles at school and emailing documents to myself from one laptop to another (don't ask). So I get Dropbox downloaded on my laptop no problem, you know, "accept, next, next, next, finish". :) But THEN, hubby informs me that he already has an Dropbox account on the iPad and you can only have one, so I am out of luck!! Luckily, hubby has patience when it comes to the genre of technology. Seriously, that boy can sit for hours figuring out something on the computer, as long as he has eaten ;-) So he figures out how to have a shared folder on his Dropbox account on the iPad that will sync up with my new Dropbox account on my laptop. Yay! So now I can drop my edited picture in the shared folder and retrieve it on my laptop to upload to the blog! Hubby and I have been swooned by this gorgeous spring Minnesota weather, even thought the winter was ANYTHING but Minnesotan, the warm sunshine still has an intoxicating feel. 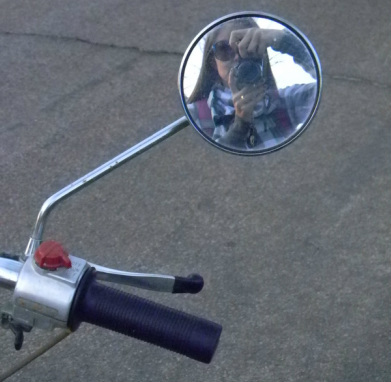 After visiting with our new neighbor kid friends, in which hubby proceeded to gang up with neighbor boy against neighbor girl and I in an argument about women's strength..haha, we jumped on our orange sherbert and banana yellow matching 1977 Honda mopeds to cruise our new stomping ground. I brought my camera (Christmas gift) eager to snap some artistic shots. It is not a DSLR (whatever that is) but we decided to get a camera that was more of a baby step towards a really fancy/mortgage-priced one. This way I am not overwhelmed with features and can work up to (and save up to) a professional camera. Let me know what you think!! Any advise? I need help with lighting I think. Anyone want to have a photography date?! Now, as you can see from the lack of updates in my "painting" blog this is an crafting genre that I struggle with. I absolutely love to draw and sketch. It seems like it would be such a simple step to move from a drawing to a sketch....but it is not as easy as it looks! I have so much to learn about tinting, shading, colors, etc. So here is my latest attempt. 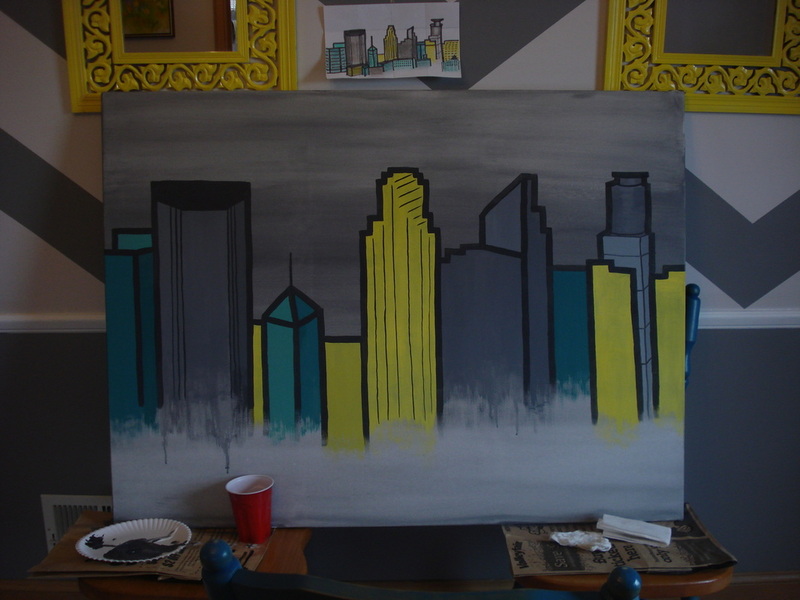 I have always loved cityscape paintings and now that we live in Minneapolis I thought I would give the Minneapolis skyline a shot. 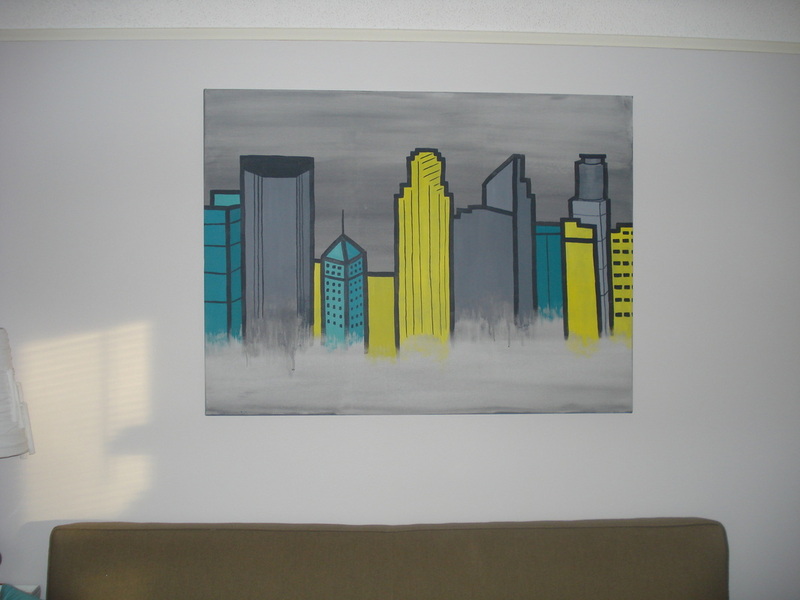 To make the painting easier I decided to try a "pop-art" style, which also goes along with the era of our house. This style also made it possible for me to include all of the the obscure colors happening in our living room. 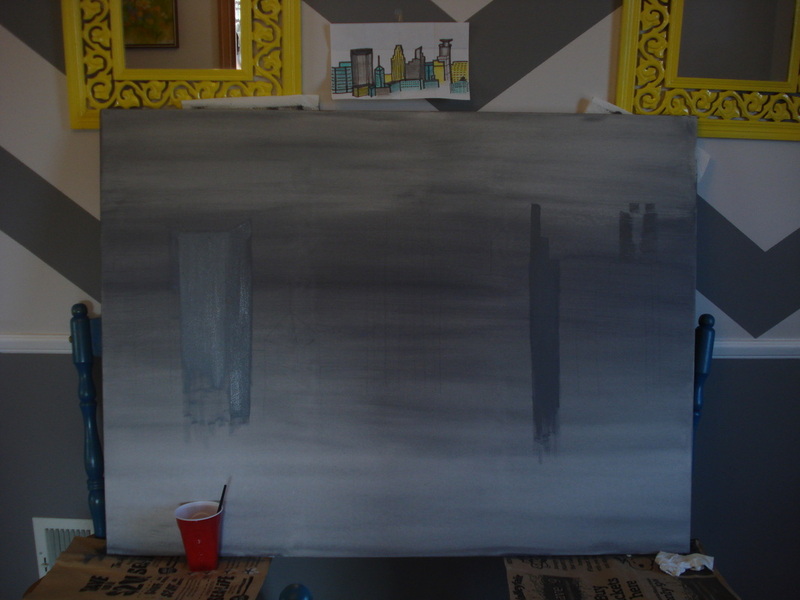 Above, I started with a light gray wash. 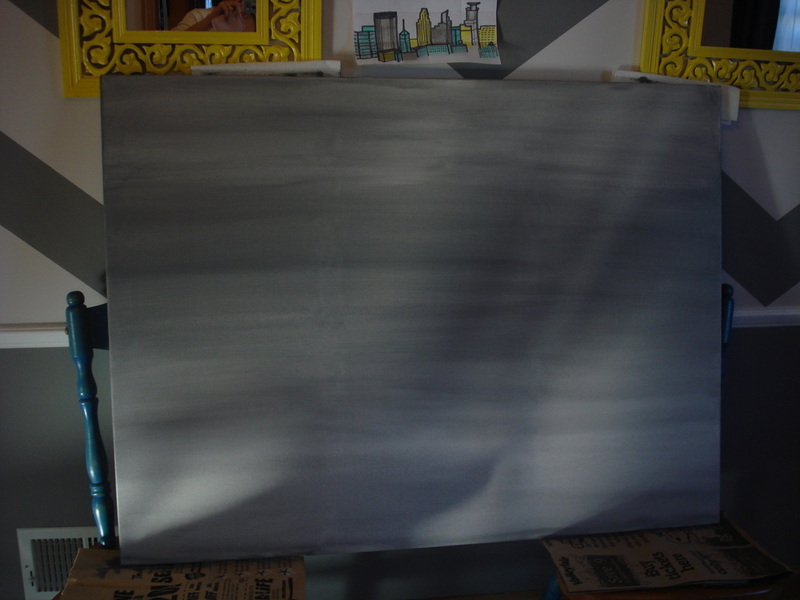 I watered down my acrylic paints and brushed it over the whole canvas. 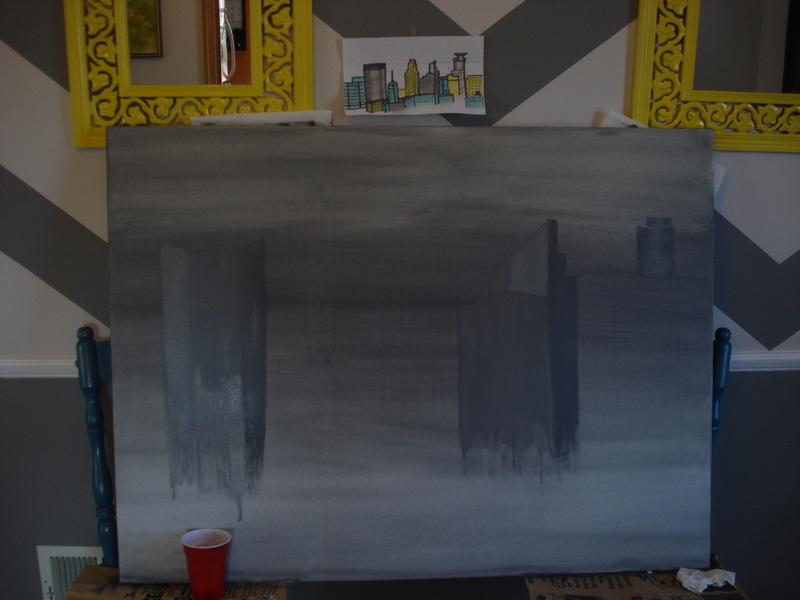 Next I painted the buildings that were going to be the darkest shade of gray. 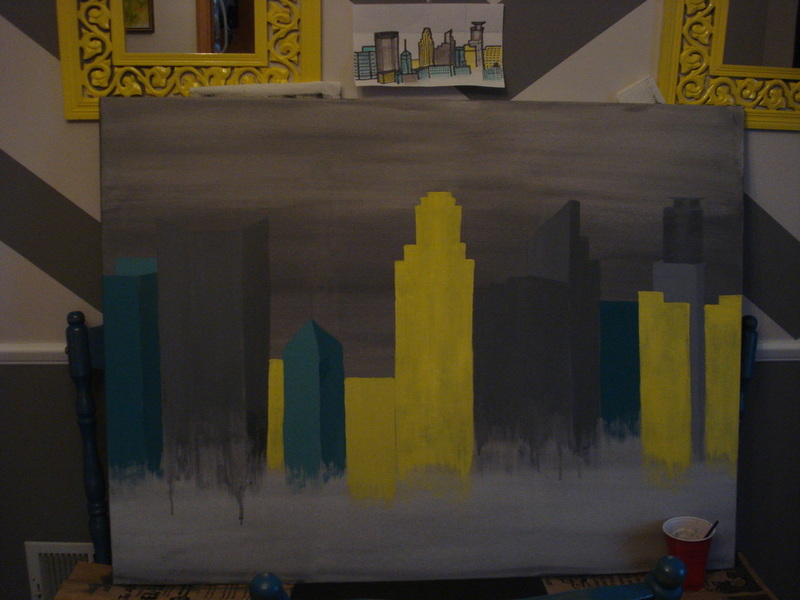 Added the lighter shades of gray. Added the thick outlines that give it that pop art feel. These pictures were taken from my cell phone, sorry for the horrific quality!! These were my very first paintings...very experimental.